This reminder, of her out-of-control development, spurred me on to put in that little bit of super-mom extra effort that we all have, and make some new activities for her to do with her nanny. So, if you’ve been following my blog, here’s the next batch. If you haven’t, check out my previous post with activities for toddlers. All you need are two pictures each of about six different fruit (printed out or cut from a magazine), some glue, a piece of cardboard and a pair of scissors. Cut the pics of fruit out and glue them to your board to lend some strength to the pictures. 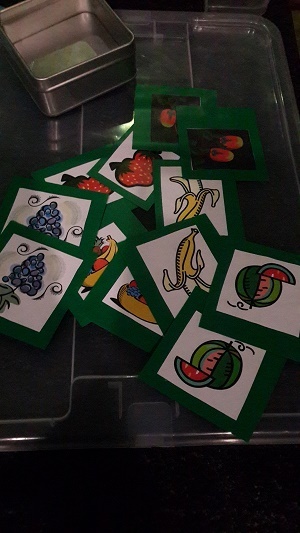 Then cut out around the pics so you have 12 individual fruit pics. Now your little one needs to match the different fruits together. 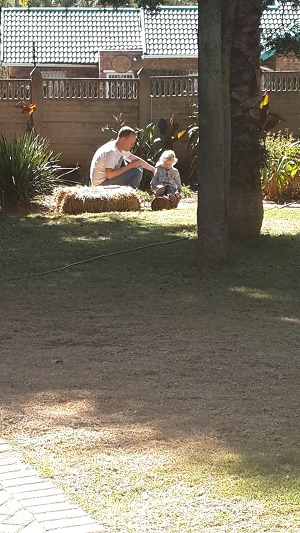 I love this activity – we learnt it at TOPTOTS. Toddlers sort different textures into different containers. 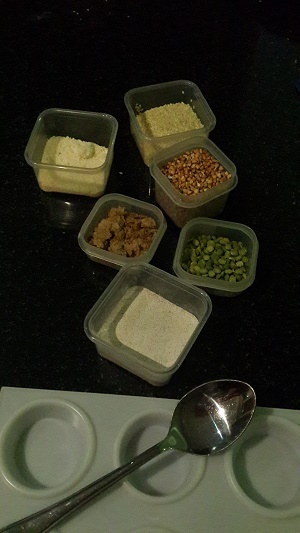 Get yourself six little containers, six food items with different textures ( sugar, cereal, oats, coffee, tea, couscous, maize meal, sesame seeds, flour) – anything you have in your pantry will work. Get a kids’ painting tray or any container with different compartments (an ice tray could work), and a spoon. Get your little one to take a spoonful of one of the foods and place it into one of the compartments. Then ask her to do the same with a different food putting it in another section. Your toddler should do this for all the foods until each is in a separate compartment. 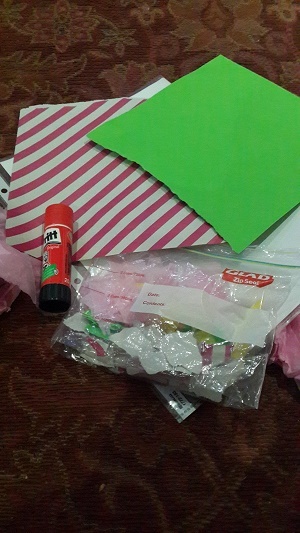 You need a plain white or light-coloured piece of cardboard to stick paper onto, a glue stick, and about four or five different coloured pieces of paper or tissue paper, torn into small pieces (about 3-4cm). Cover your cardboard in glue and get your sweetheart child to stick pieces of coloured paper all over. They need to pick up the pieces off a tray or the floor and press them down so they stick. These are simple activities you can prepare at home for your toddler to do. They don’t need a lot of time to put together, we’re all busy moms – ain’t no one got time for that – and they don’t cost anything or a lot at all. Just use things you’ve go around the house – improvise. And enjoy! This entry was posted in Banter and tagged activities for toddler develpment, activities for toddlers, fine motor skills, fun activities for toddlers, learning about colours, matching objects, mommy blog, pincer grip, sensory development, toddler development, toddlers on July 28, 2014 by simonewb. Estelle the Lady of the House! The Meldau’s home is situated on the same stand as Woodrock Animal Rescue’s shelter. The rules of the Meldau house may seem odd and foreign to most, but to Estelle it’s a way of life. Wood Rock Animal Rescue is an animal sanctuary which upholds a pro-life policy. Their focus is to rehabilitate, re-home and rescue animals of all kinds, until there are none left. Visiting the Meldau house is like no other experience. You must be prepared to be attack-greeted by 20 odd, very confident, affectionate and over-bearing dogs. If one met Estelle in a public forum, one would never guess this is the way she chooses to live. Estelle and Nicholas have tailor made their lives to involve their animals. Both are qualified people: Estelle a teacher and Nicholas an accountant. Together they’ve achieved their dream of building and operating a safe haven for 150 homeless dogs, 12 honorary cats, 9 donkeys and 30 geese, ducks and chickens. Woodrock Animal Rescue is a non-profit, pro-life, no-kill, rescue, rehabilitation and re-homing facility providing assistance to unfortunate, homeless, abused, neglected, stray, injured, ill, geriatric and unwanted animals that would otherwise have miserable lives and premature deaths. Estelle and Nicholas have well on 20 additional ‘keepers’ (give or take) at their home. 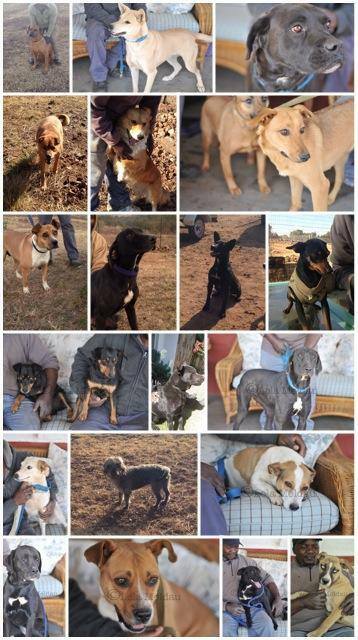 Most of these home dogs are damaged. Each dog knows his or her place in the hierarchy. The matriarch of the home is Emma, a large slow geriatric boerboel who dominates the covered couches. She agrees to share her abode with Oumie a Never Ending Story look-alike. Estelle often gets calls from people surrendering a family pet as they ‘aren’t getting along or they are misbehaving’. Yet we don’t have any such issues. Estelle’s reaction is, how can that be possible? There is always a fundamental reason which, with a little effort on the owner’s part could be sorted, for example aggression at feeding time; simply feed the dogs in separate areas. Abby, a black Labrador cross, chooses the front area of the house as it is close enough to observe a new comer and easily accessible to the snack box – known as the kitchen. If you stop Estelle to ask about one of her dogs, she simply rambles on and, with great glee, she’ll indulge you by giving you detailed explanations of each dog. How they arrived. Why they arrived and what absolute joy each pet gives to the family, insisting that she is the lucky one. She also will always remember your dog’s name but forget yours. Chummy is her funny man – a pug cross jack russel. He’s referred to as the dishwasher and is very clever at accessing plates of our food, when our backs are turned. This adorable boy took months to warm up to touch. Today he is a cuddle bug; the power of love! Walk up to the main room and at the top if the banister and you are welcomed by a very robust large happy loud dachshund called Eddy Bear. This big boy is the only dog that is not a rescue. He is treated with dignity and has an aloofness about him. Eddy is 16 years old but looks 6. Jenny, a brown dachshund in a Labrador’s body, has the chosen place of her head on the pillow on the main bed. She comes bounding up the stairs with such joy. Jenny is the naughtiest dog of all and the most protected by Estelle. Don’t try to say she is spoilt or given too much rein; you will be shut down. As soon as you open the security gate to the bedroom, Jenny will sprint into the room, grab a massive mouth full of cubes and jump onto the bed to snack, her cheeks bulging like a chipmunk. Opening the gate is a process on its own as one must manoeuvre going up a flight of stairs with some 10 dogs challenging you. On approaching the landing there is a race to see who can get in first and of course push the gate as hard as possible creating a spring back reaction which needs to be controlled. Twelve dogs, who have chosen the upstairs room as their very own, each have their own bed carefully made with clean blankets. This arrangement may change depending on snack and activities downstairs. Lucy, an old senile ridgeback cross staffy, who walks with a wobble, has 2 main aims in life: One is to keep a watchful eye on her master and lord, Nicholas, and the other is to keep the other eye on Jenny, her nemesis. The 2 of them will raise the level of barking to fever pitch and ‘who’s your daddy?’ play fighting is par for the course. Estelle is most tolerant of this activity as she finds it cute and humorous. The pair doesn’t get into any real scuffle. Thali often finds herself involved in this activity as once the ‘fight’ commences she takes it upon herself to bark incessantly. She is a small Alsatian that belongs to Estelle’s son. Thali is getting on in years and has a disorder that has caused her to go blind. She has adapted well and finds the activities at home keep her involved. At first she was disillusioned and showed signs of depression. Sadly she sometimes misses a stair. Buksie is a beagle cross. This adorable small man is around 15 years old. As hard as Estelle tried, he found adjusting to human attention hard. He wanted to be transparent and just ‘be’. Today he is the first in queue to take part in every activity. Thumper hobbles along upstairs and downstairs as the poem goes. This little mongrel is a victim of a hit and run. He is simply delightful and makes for a very easy boy with no hang ups. He bears the scars of the accident but has no scars emotionally. Chucky, a Pygmalion happy boy, lives up to his name. He is such a magnificent dog, yet has a demon nature – do not try touching him (except Nicholas). He regards himself as the aloof big deal of the dogs. We just love his ‘holier than thou’ attitude. He has a space in the home and in Estelle’s heart. Smiles all round. The last recruit is darling Wesley. Taking care of this little paralysed dachshund is truly like having a baby in the house. Once Estelle has put down her bag and run a bath, laid out Wesley’s nappy change, Wesley is bathed (she expresses him as he is incontinent). He gets his cream and Nappy on. Then he gets rigged up into his wheels and takes part in the normal running of the Meldau home. He really is an expert in his wheels and speeds around like Charlton Heston in Ben Hur. 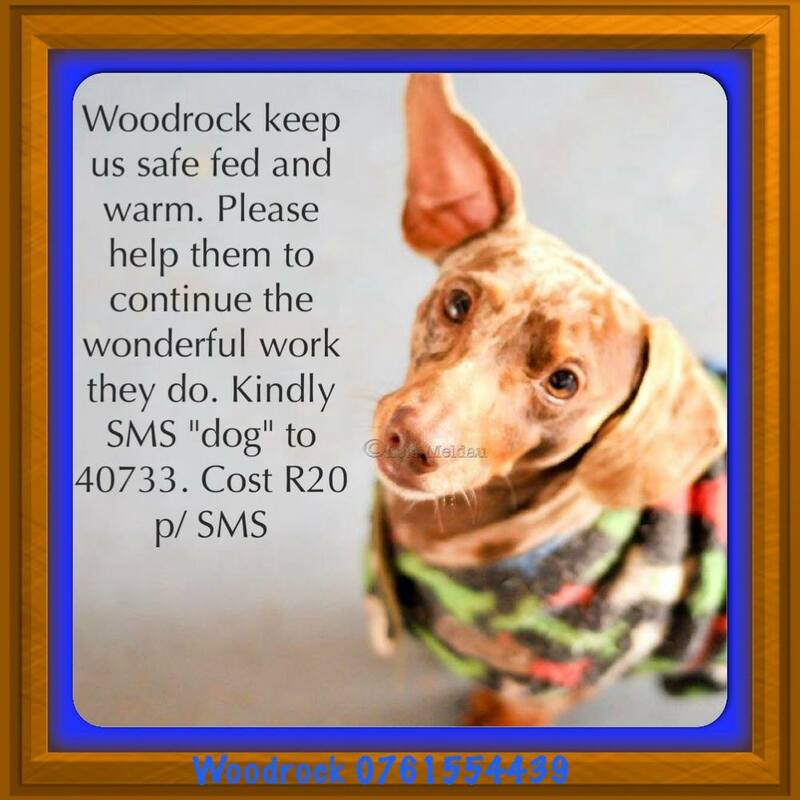 To contact Estelle go to http://www.woodrockanimalrescue.org.za/ or call 076 155 4439. 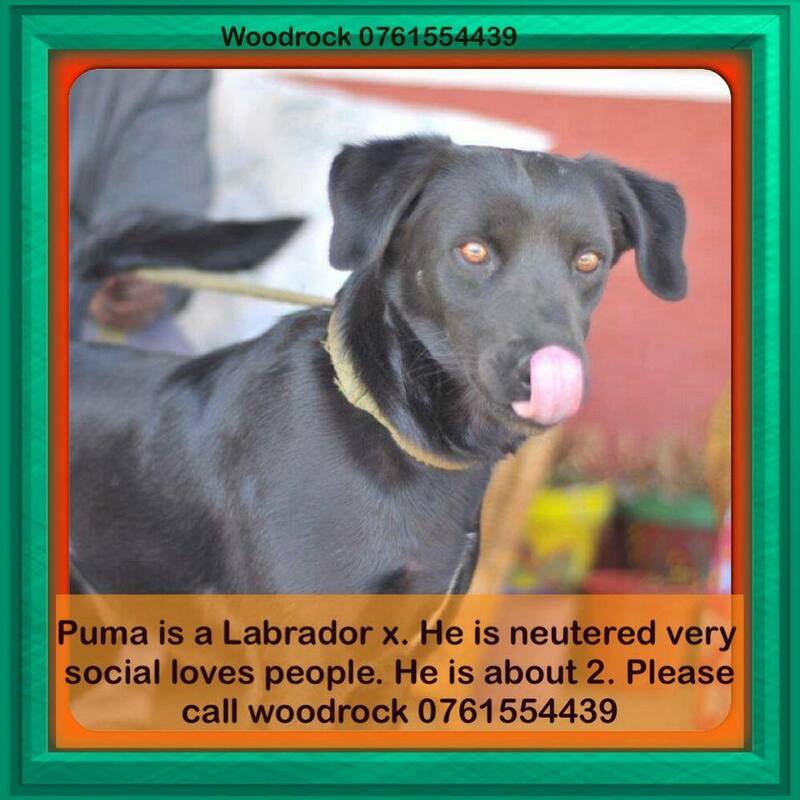 This entry was posted in GUEST POSTS and tagged animal sanctuary, animal shelter, dog shelter, dogs, pro-life policy, Woodrock Animal Rescue’s shelter on July 16, 2014 by simonewb.